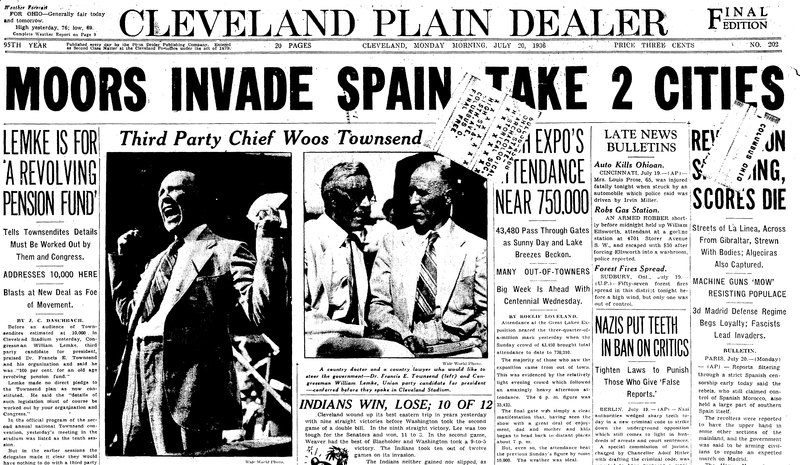 Cleveland Plain Dealer front page, July 20, 1936. Abstract of the 2012 George Watt Memorial Award in the Undergraduate Category. Read the full winning essay here. By the mid-1930s, the Great Depression had thrown the United States into political turmoil and radical political parties were gaining popularity. When General Francisco Franco attempted to overthrow the legally elected Republican government of Spain in 1936, sympathetic Americans, organized the “Abraham Lincoln Brigade” and 3,000 volunteered to fight against Franco. U.S. newspaper coverage of the volunteers reveals the domestic and foreign policy debates that arose in the late 1930s and continued into the late 1950s. “A Peculiar Fate: American Press Coverage of the Abraham Lincoln Brigade” explores the impact of these debates upon the lives of the surviving volunteers and the national identity during this period. 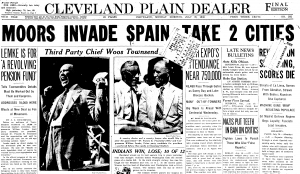 My paper focuses particularly on The Cleveland Plain Dealer, which was sympathetic to the cause of the Spanish Republic due to the left-leaning population of the greater Cleveland area. During the first phase of the war, men from every walk of life were encouraged to volunteer. Press coverage drew attention to how soldiers were (supposedly) no longer pointlessly sacrificed as they were in World War I. Race was presented as a non-issue in Spain. As casualties mounted, however, those on the left became increasingly hesitant to lose more men to a lost cause. By the end of the conflict, the leftist press, obviously disillusioned, maintained that Americans should no longer volunteer. Brigaders who returned to the United States after the war faced persecution from anti-communists and racists well into the 1950s. Press coverage during this time period provides a unique insight into the roots of the American debate over isolationism and interventionism during the World War II, the civil rights movement, and the rise of McCarthyism.